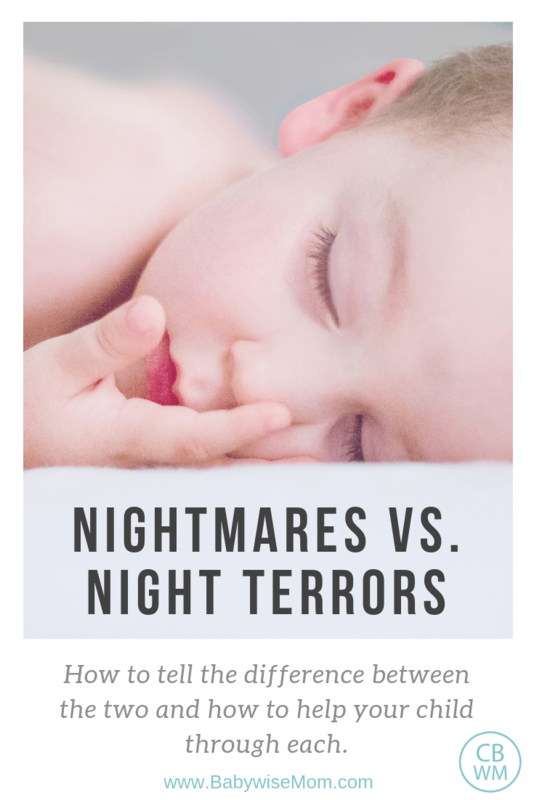 Nightmares vs. Night Terrors: How to distinguish between a nightmare and a night terror and how to help your child through each. When your child wakes crying in the night, it can be really hard to figure out why the crying is happening. Is he in pain? Is he hot? Is he cold? Is it growing pains? Is he sick or teething? Is he having a bad dream or a nightmare? Is it a night terror (or sleep terror)? There are a lot of possibilities that run through your mind in the middle of the night as you attend to your crying and upset child. When my children can’t sleep or are up in the night, I always consider pain or sickness first. If the child is in pain or sick, I do what I can to help alleviate the discomfort and get the child back to bed. Once you have addressed the pain, health, and comfort, consider the possibility of your child having bad dreams, or nightmares, and/or night terrors. In my experience among my four children, not all people are inclined toward having night terrors or even nightmares. Brayden and Brinley are our two children with propensity for nightmares and/or night terrors. Brinley had nightmares, and as a six year old, she still will at times. She has not ever had a night terror. Brayden, our oldest, had clear nightmares and night terrors. He started having night terrors as a preschooler. I did not recognize the night terrors immediately, but my husband had them as a child and knew that was happening immediately. It is trickier when your child tends to have both nightmares and night terrors because it takes a minute to decide which is happening. Here are some distinguishing characteristics of nightmares and night terrors to help you know all about nightmares vs. night terrors. The child will wake up during the nightmare and be upset. The child will be able to have a conversation with you. Your child will be able to tell you details about the dream. The child will remember being up crying the next day. Your child will know you went in there or that she got out of bed. A child with a nightmare can be comforted and consoled. Nightmares occur during REM sleep (read about that at the National Sleep Foundation). With night terrors (or sleep terrors), the child will wake up and appear to be alert. The child can be agitated, upset, and crying. A child with a night terror cannot be consoled. The child will usually not make much sense if you manage to have a conversation. The child will be upset until he suddenly stops and goes back to sleep. The child might sleep walk. Sleep walking is common with children who have night terrors. As Brayden got older, he would sleepwalk. Instead of being upset, he would get out of bed and walk around the house. He would come sit with us and have a conversation, then leave and go back to bed. The conversation did not make much sense and you could tell he wasn’t really present. The child will not remember any interaction you had during the night terror. Even a full conversation will be completely forgotten. This is your biggest hint toward if it is a nightmare or night terror. A child with a nightmare will calm down while awake. She will want mom or dad’s comfort. A child with a night terror will not make much sense and will go back to sleep without resolution happening while awake. The next day, the child with the nightmare will remember vividly and the child with the night terror will not remember at all. The child might remember very little, but no details. Night terrors do not usually start until around age three, though you may see them starting in age two (Wonder Weeks page 467). They are most common around ages 3-12. Night terrors happen during non-REM sleep. Even with the details above, it can be hard to be sure if your child is having a nightmare or a night terror when she wakes up screaming in the night. With time and experience, you will come to recognize if it is a nightmare or a night terror. Here is what to do when your child has each. Be sure to see my post for full details on what to do when your child has nightmares. Have a regular sleep schedule and a good bedtime routine. Overly tired children are likely to have bad dreams and nightmares. Consistency will help ward off nightmares. Get the temperature and dress right. If it is too hot or too cold, your child is more likely to have a nightmare. See Can It Be Too Hot To Sleep? for more. Be aware of any books or media that leads to your child having nightmares at night. Talk through the nightmare with your child. Let her tell you all of the details. Consider stress in your child’s life. During REM sleep, our brain processes our day. If your child is worried about something that has happened or will happen, that might lead to bad dreams during REM sleep (which is when nightmares happen). Be aware of foods. Certain foods can spark nightmares. Take notes. If your child has a nightmare every once in a while, it isn’t something to stress over. Nightmares are a normal part of development. If it is a common problem and your child is starting to worry about sleeping, it is time to see what you can do to prevent it. When your child has a nightmare, take literal notes of what happened the day before. What was the temperature like? What was the bedtime routine like? Was bedtime on time? What stresses are happening? See if you can find patterns and mitigate them. Night terrors are not as common as nightmares. If your child is up crying in the night, it is safe to assume it is a nightmare. If your child does not make sense and does not remember being up crying the next day, there is an excellent chance it is a night terror. Get the temperature right. We found with Brayden that if his room was too hot or cold, he would have a night terror. Do not let air blow directly on the child. To prevent the room from being too hot, we would put a fan in the room. That was always a problem if it blew on him. We made sure the fan did not hit his bed. Have a consistent bedtime routine. Wait it out. You won’t be able to wake the child up, so do not try to. Remember there is no harm happening. It can be gut-wrenching to have your child crying and not being comforted by your efforts, but remember, your child will not remember the next day. Stay with your child so you can ensure he won’t get into anything dangerous. You do not want him hurting himself or sleepwalking right out of the house. A night terror usually lasts 5-30 minutes. Once the night terror is over, your child will simply go back to sleep. 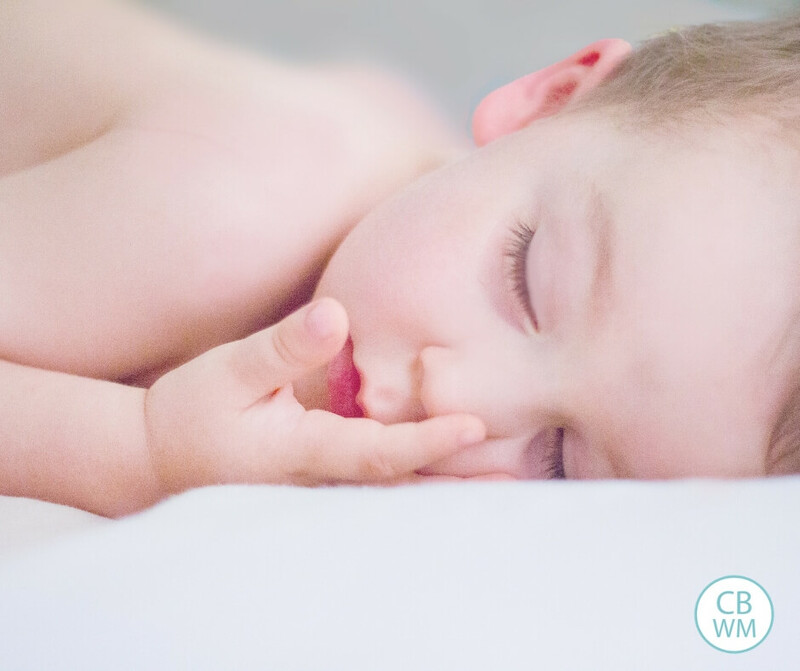 If a night terror is predictable night to night, you can try the Baby Whisperer’s strategy of wake to sleep. If a night terror happens at 11 PM each night, wake your child up at 10:55 PM. This may prevent a night terror from happening. Do that for a few nights and then stop and see if that fixed it. If your child has consistent nightmares or night terrors, it is a good idea to discuss it with the child’s doctor or health care provider. For the occasional ones, follow the steps outlined above to help your child through it and prevent further problems.